I am just so sad this morning. So very sad. We have quite a few mass shootings in the US each year, and it’s not something you get used to (thank goodness). But this time it’s so much worse for me. I feel like geeks are my people–all geeks, everywhere. Internet culture, including Twitter, the Nerdist podcast, and the like, have done a lot to knit the entire world of nerds together into one big, intelligent, quirky, sometimes-cantankerous, awesome family. So when the shooting takes place at a screening of one of the biggest geek-films of the year, and it’s carried out by someone who may have (as early reports seem to indicate) known the film well enough to emulate it, it hits closer to home in a way that’s more real for me than mere physical distance. I hate the thought that that kind of sickness and pain exists in my “family.” And that one individual’s sickness and pain has led to the suffering and anguish of so many more. My thoughts and prayers and wishes and everything else go out to each and every individual involved–wherever in the world they may be. Caution: Unabashed gushing ahead. If you’re looking for some sort of critical review, kindly move along. Today I wanna get all slobbery about a new, exciting thing I just started loving. Additional Caution: This post contains neither Doctor Who nor knitting–nor geeky TV of any kind. BUT, it is about a comic book (that’s geeky! )–one written and illustrated by a lovely fella who has also written and illustrated Doctor Who comics. So, um, are we good? Good. Matthew Dow Smith’s October Girl is so far up my alley, my alley is kinda sore. It hits me squarely where I live in so many ways that I probably can’t even cover all of them here, but why not try? 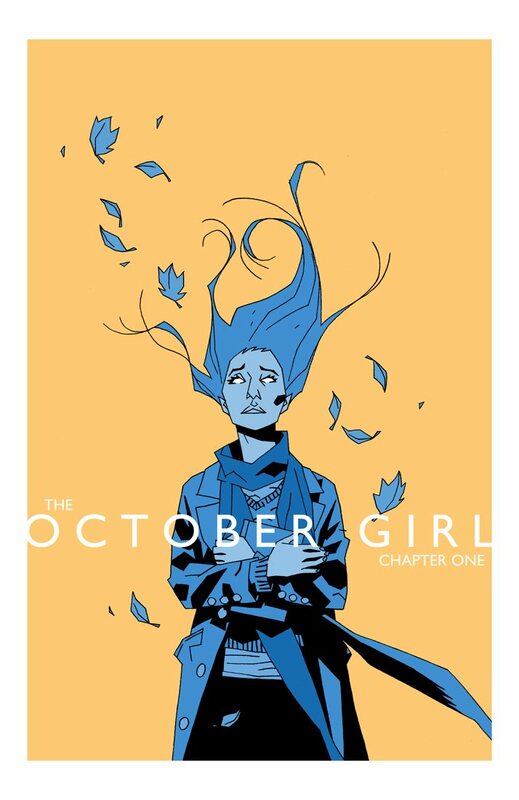 Let’s start with the title: October Girl. First: “October” There’s something about autumn that I’ve always found magical. (I mean the season, not the main character–whose name happens to be Autumn Ackerman.) It’s the time of year when anything can happen. Even the air smells like wonder and mystery. Some think of fall as the season when things start dying. I see it as the season when things go to sleep. And this means there is life and energy that’s now simmering under the surface. What could be more mysterious and exciting than that? And part two of the title: “Girl” I am a girl. This speaks to me. End of. Okay. Moving past the first two words. This story starts mysteriously. I still don’t really know what it’s about, and I can’t wait to find out. The air surrounding it smells like the fall air I mentioned. It’s redolent of “what if?” and “imagine this!” and “guess what?” There’s something vital going on that I can’t quite grasp yet, but I know when I do, it’s going to be amazing. The story’s main character, the (I assume) October Girl herself, is named Autumn. Yes, this is a clever play on the title. And yes, I love it. Autum starts this story talking about imaginary things. I think this will resonate with…well just about anyone, but it definitely hits me right where I live. As a kid, I spent far more than a healthy amount of time in my head having imaginary conversations. I knew I was imagining things. Autumn may or may not have. Regardless, the chord was struck. In addition, she compares the lovely things she imagined with the harsh reality of the “actual” world. Hello every-morning-of-my-life. This appears to be a story of discovery. I love that kind of story. I want to go on a journey with the main character. I’m delighted by not knowing what’s around the corner, and by knowing my page-bound companion doesn’t either. There is no better way to hook me into a story than to tantalize me with the barest few hints and promise to reveal dazzling secrets before the odyssey is over. This first issue snared me in exactly that way. I am on tenterhooks waiting for issue 2. And then there’s the art. As those who know me well can probably tell you, I’m not an art fan. I don’t like museums; my walls are decorated with movie posters and maps and jigsaw puzzles rather than paintings; I can’t tell a Monet from a Manet from a matinee. But occasionally in comics, I do notice the art. Sometimes the style and the feel of the artwork reflects and enhances the mood of the story so well that the comic becomes more than the sum of its parts. That’s what’s happening here. I wish I knew how to talk about it. There are neat angles and perspectives and shadows, and some things are…chunky. I’m not really selling it, but trust me; it works. The pictures and the story are breathing the same air. And I like it. And that’s rare. And that excites me. It’s official. Matthew Dow Smith has knocked it out of the park. I can’t remember the last time I was excited about a new comic book. Oh wait, yes I can. It was when Neil Gaiman was writing 1602. So it’s been nigh on a decade since I purchased a new comic–until I slapped down my electronic coin for this treat, that is. Jeepers, for only 99 cents, you really can’t go wrong. Best less-than-a-dollar I’ve spent in yonks. Note that I haven’t really told you anything about the story itself. That was on purpose. There are a buncha places you can read a teaser or a short synopsis. (A very good one is monkeybrain comics, where you can procure this gem [and others] for yourself.) I think it’s more fun to go in knowing as little as possible, so I’ve left you the option to do that.